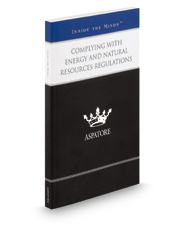 Complying with Energy and Natural Resources Regulations provides an authoritative, insider's perspective on exciting developments in the dynamic energy markets environment and regulators' attempts to provide meaningful oversight in this ever-changing field. Written by partners from some of the nation's leading law firms, this book guides the reader through the revolution in the development and financing of the U.S. electric power grid, which has led to a breakdown in the control of local utility monopolies and emerging new relationships among generators, power deliverers, and their joint customers. These top lawyers discuss selected provisions of the Energy Policy Act of 2005 and the 2009 Recovery Act that focus on how federal regulatory oversight of the electricity market has evolved and provide examples of the impact these provisions have had on the private sector, general public, and state and local municipalities. Additionally, these leaders highlight FERC's regulation of energy markets with a particular emphasis on the agency's rules prohibiting market manipulation. The different niches represented and the breadth of perspectives presented enable readers to get inside some of the great legal minds of today, as these experienced lawyers offer up their thoughts on the keys to success within this complex field.